Lenovo still continues to produce its popular IdeaPad Y series laptops, but the Y410p is no longer available other than in the second-hand market. For more current laptops in this size range, check out the Best 14 to 16-inch Laptop article. 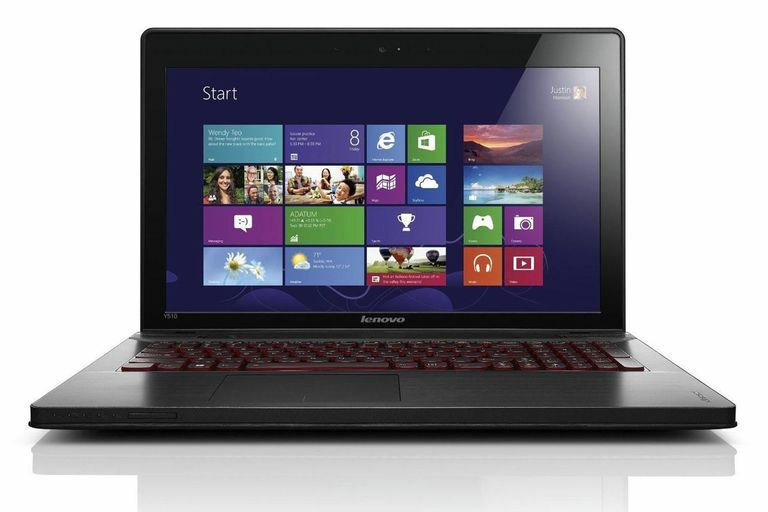 Dec 11, 2013 - Lenovo continues its trend in making affordable and very capable systems with the IdeaPad Y410p. The system offers a bit more portability for those that still want high performance for demanding work or even PC gaming. It also offers flexibility that many other systems lack with its Ultrabay which can swap out the optical drive for additional graphics or storage. Even with such features, there is still room for improvement by Lenovo as the system does have minor issues such as below average battery life, a display that doesn't quite reach 1080p and just a single USB 3.0 port. 13.8" x 9.6" x 1.3" @ 5.5 lbs. Lenovo's IdeaPad Y410p takes much of the same design elements from the past Y400/Y500 laptops and instead focuses in on upgrading the internals. It features an aluminum deck and lid that offer it a nice premium quality feel while also given it resistance to scratching and smudges. This is a traditional class of laptop so it is much thicker than most new laptops at 1.3-inches thick and a hefty 5.5 pounds weight which seems a bit heavy for a 14-inch laptop. Powering the Lenovo IdeaPad Y410p is the Intel Core i7-4700MQ quad-core processor. This is the latest Haswell based processor that offers a greater level of efficiency and a minor performance boost over the previous Ivy Bridge-based processors. It should provide more than enough performance for those looking to do some serious computing work such as desktop video work or gaming. Lenovo matches up the processor with 8GB of DDR3 memory that should provide it with a smooth overall experience with Windows and its programs. For this configuration, Lenovo has decided to include both a traditional hard drive and a small solid state drive. The one terabyte hard drive provides the system with a large amount of storage space for applications, data and media files. Meanwhile, the 24GB solid state drive is used as a cache for the hard drive to improve the boot and loading speed of frequently used programs. Boot times are improved at roughly fifteen seconds but still not as quick as a dedicated solid state drive. If you do need to add more storage to the system, there is a single USB 3.0 port on the front left-hand side of the system. This is a bit disappointing as most systems are featuring two to three of the ports now. There is still a dual-layer DVD burner for playback and recording of CD or DVD media that is built into a swappable bay. Those that don't need the drive can opt to purchase optional storage or even secondary graphics processor units. The display for the IdeaPad Y410P is a bit smaller at 14-inches compared to most other traditional laptops that opt for the larger 15.6-inch display. While this makes the system smaller, Lenovo has also elected to use a lower resolution 1600x900 panel. This means it does not have as much detail as the larger IdeaPad Y510p and will likely be the deciding factor between which of the two models your will want to purchase. Overall it is a very nice panel that offers very good color and contrast not to mention a high level of brightness which is useful for situations where they may be a lot of glare. Powering the graphics is a NVIDIA GeForce GT 755M graphics processor. This is a good mid-range graphics processor and works nicely with the display panel resolution. It can run many games at the full native resolution of the display bit some will need to have detail levels turned down to keep up smooth frame rates. Lenovo uses the same keyboard design that they have used on the previous IdeaPad Y series laptops. It features an isolated layout design that features a red backlight. The only downside here is that the smaller size means that there is no numeric keypad and some of the right-hand keys have been reduced in size. Overall, it has a very nice feel thanks to the sturdy deck and concave keys that should help it be very accurate and comfortable to use. The trackpad is a nice large size that worked well with both single and multitouch gestures. For the battery, Lenovo has elected to use a standard 48WHr battery that has been typical of most traditional laptops in this size range for some time. Lenovo claims that this can ran up to five hours but does not specify under what conditions. In video playback testing, the laptop was able to run for three and three-quarter hours before going into standby mode. Of course, if the system is going to be used for demanding tasks like gaming, it will certainly have a much shorter running time. Sadly, this puts the battery life of the IdeaPad Y410p behind many other laptops even others designed specifically for gaming. It certainly is a far cry from the over eight hours that the Apple MacBook Pro 15 with Retina Display is able to achieve with its battery that is twice the capacity rating.